Wow, I sunck into the concert for free! After the show I met Joni and Jackson Brown when they stepped out in front of the concert hall,I introduced myself and we struck up a conversation. Joni said they were planning to stay in NOLA for a few days and were going to be looking around the French Quarter to take pictures of Roof Gardens and would I be avaiable to show them around? Well, heck ya! Fine they said meet us at the Royal Sonesta Hotel in the morning o.k?I had my own guitar and was a street muscian at the time along with my dog named Sam.I met them both, first I stopped at the front desk and they called up to the room for me and bounding down the stairs was my new friend Jackson Brown!!! I thought I was hallucanating again and realised I wasn't when Jackson said Hi Gac! 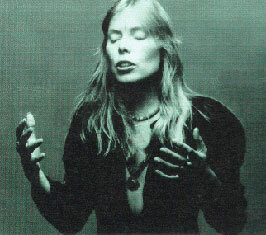 ( that was my street name at the time) He said Joni would be down shortly, well we were off! I walked them down by the river front by the old wearhouses where the roof gardens were growing..these roof gardens they were lookin for were old gutters that the birds had dropped seeds into and when it rained they would grow plants out of the gutters, thats what they were looking for! Joni and I jumped up on a big blue mailbox and Jackson took a picture of me, I would love to have a copy to show my wife Mary and daughters, just to prove I really did know them personally.Joni gave me a beautiful green jade ring , for showing them around, we ate lunch at some Mexican resturant that they picked out and it wasn't very good, so I suggested we go on over to "Buster Holmes" red beans and rice resturant, so we did and it was great and they both loved it! While at the resturant it started raining so we decieded to stay awhile and wait it out. I noticed an old stand up piano in the corner and suggested we play something while we waited for the rain to stop, and so we did play a little music for the folks in the resturant and had a great time of it! I couldn't believe this was all happening to me! what a wonderful time we had and I'm grateful for the exiperence and will always remember it, although the pictures would be nice, I still see them in my minds eye today just like it was yesterday! I'm sober 22yrs. and it is a wonderful memory and will always cherish it along with many others of the stories of on the road with my dog Sam and guitar..